The concept and reasoning behind the cylinder and bed machine was driven by the newspaper. Larger sizes, more pages at a greater speed became the fundamental reason for developing such a machine. William Nicholson, an Englishman, patented a crude bed and cylinder design in 1790. Flawed by ineffectual management of his ideas - as Nicholson was not a printer by trade - the concept went nowhere. 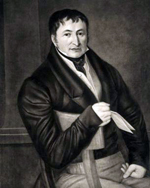 It was not until Friedrich Koenig, a Saxon-born bookseller, traveled to England in 1806 and stumbled upon newspapermen who encouraged and financed his major accomplishment, was the first successful press developed. The result was a press built in 1811, and later the famous press he constructed in 1814 for The Times. In subsequent years, Koenig returned to Germany, and with his engineer partner, Andreas Bauer went on to form Koenig & Bauer - known today as KBA. The success of Koenig’s design signaled a new wave of thinking and a plethora of men designing machines in all types and formats. Most proved unsuccessful, but many small shops did succeed. Quite a few were also former Koenig & Bauer employees, who went on to form highly successful businesses. Among the notable German concerns were M.A.N., Klein, Forst & Bohn, Dresdner Schnellpressenfabrik, VOMAG, Rockstroh & Schneider, and S.G. Schelter & Giesecke, and Albert Frankenthal. Albert would eventually be taken over by Koenig and became the "A" in KBA. In America, an exciting period of design and mass production – the fundamental quality we know today as the “American System of Manufacturing” - was born out of the armament industry and this led to some legendary machines such as Miehle, Potter, Campbell, Babcock, Cottrell, Miller and Scott. Miehle went on to become the largest and most popular cylinder press in the world and was manufactured in all sorts of sizes up to 78”. 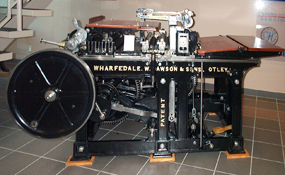 Robert Miehle even licensed his 2-revolution cylinder press to the Linotype & Machinery Co. in England. STOP CYLINDER whereby at each revolution, the cylinder remains stationary allowing the bed to return. The Johannisberg is an example. TWO-REVOLUTION whereby the cylinder continually rotates two revolutions without stopping and the 2nd is used to return the bed. The Miehle is an example. CONTINUOUS REVOLUTION which has an impression cylinder twice the diameter of the bed and the “gap” in the cylinder allows the bed to return. The Heidelberg OHC is an example. OSCILLATING CYLINDER where the cylinder follows the bed back and forth. The Little Giant is an example.